The call for proposals for the Conservatoire du Littoral’s much-anticipated development project around Galion beach will go out before the summer, comprising three phases. The first is for the demolition of recent walls, plus the cleanup and clearing of the site. The second is for excavation, roadwork, and various utilities, the goal being to return the area to its natural state as much as possible, and not build anything in concrete, except the road, which will be compacted and flattened. The third phase is for the installation of five picnic areas, a trash collection area, two ecological toilets, a wooden deck for a restaurant, and signage. A parking lot for up to 100 cars will be set back from the beach, as well as a parking area for busses. Borders with wooden posts and low fences will safely guide visitors to the beach. The closest approach to the beach will be limited to fishermen and the surfing club, who will have keys for access. Two beach volleyball nets are planned and children haven't been forgotten, as there will be a playground, which hasn't been announced yet, in order to surprise them. This project typical of others done by the Conservatoire, is ensured buu a cotnract funded 80% by the government and 20% by Conservatoire. There will also be a call for proposals for an itinerant restaurant, environmentally correct of course ! The Réserve Naturelle, which manages the Conservatore's land, will be responsable for planting vegetation in the Galion Zone. Coconut palms, gommiers, sea grapes, and mahogany are amonf the trees planned, all of which reach a height of at least 5'2" to 6'5". Only 20 cinder blocks are left of the 300 used by the Réserve to build the nine structures of the BioHab artificial reefs implanted off the coast of Petites Cayes after hurricane Irma! What happened to the other 280 blocks of concrete? Additional investigations will take place once the sea is calm and clear, but for Julien Chalifour, scientific director, this phenomenon is hard to understand. Near Pinel, on the other hand, the artificial reef less exposed to large swells, was impacted but held fast against the elements, in spite of the shallow depth at which it is implanted. Since November, the turbidity of the water filled with sediment, and strong swells have made it difficult to dive, so that the Réserve still has numerous sites left to evaluate post Irma. However, the hurricane badly damaged two sites identified a few years ago for their interesting density of Elkhorn coral (Acropora palmata) and Staghorn coral (Acropora cervicornis). The majority of the branches of the coral were broken and all that remains are the stumps of these colonies, while a multitude of coral fragments are strewn on the ocean floor. These two sites –North Cove Bay on Tintamare and the rocky point located to the south of Orient Bay– represented a refuge for these two species of branched coral due to the cool temperature of the water, which is regularly freshened by the movement of the waves. Where did the birds go? The Réserve Naturelle asked itself this question the very day after Irma hit, and there really isn’t an answer. The scientific study led by Caroline Fleury and Ashley Daniel in November and December proved that there are approximately one third as many birds present as there have been at this time in previous years. Example: between 164 and 372 black-neck stilts were counted every month in 2016, and only 65 of these birds were seen in November 2017 and only nine in December. As for Anatidae, or waterfowl including the Bahama pintail duck, 102 individuals of this species were noted in December 2016 and only 43 at the same time last year. The extremely high water level, especially in the Guichard pond, explains the scarcity of small wading birds, such as sandpipers and plovers. The Guichard pond did however provide a moment of consolation to the staff of the Réserve, thanks to the presence on the same day in December of three rather rare species: a shoveler duck, a pair of northern pintail ducks, and three black-headed diving ducks. Following the enactment of new rules about approaching marine mammals in the waters under French jurisdiction in the Antilles last March 15, the Agoa management committee met in Martinique on November 29 and 30, to create a charter for best practices of whale watching. While the new rules prohibit any person to approach a marine mammal any closer than 300 meters, a dispensation can be provided by Maritime Affairs in the event that the person requesting it has been briefed in the best practices for whale watching, as led by Agoa in its new training sessions, and agrees to sign the corresponding charter. On November 30, the “charter for a responsible practice of commercial activities for the observation of marine mammals in the Agoa sanctuary” was submitted to the management committee, which, after examination of the document, raised several points with which it did not agree. This charter will be put into place but remains open to evolution, after recommendations by the committee. In Saint Martin, Nicolas Maslach is the local correspondent for AGOA, and with his deputy Julien Chalifour, is part of the general administration. Agoa welcomed a new member to its management committee: Michel Vély, president of the association, Megaptera, which has just created a branch in Saint Barthélemy. Megaptera and the Réserve Naturelle have collaborated for the past four years on Megara, the scientific study of the migration of humpback whales in our waters. Seven reports in 2017 stated that sea turtles were beached or in distress, of which four of the turtles were dead. Five of these problems were noted outside of the Réserve Naturelle. The collision with a motorboat represents the first cause of death for these reptiles that are protected in Saint Martin; the second cause of death was due to fibropapillomatosis, a herpes virus first seen in the waters of Tahiti, which now impacts sea turtles all over the world. The occurrence of this disease, normally not transmissible to humans, underlines the importance of not touching the turtles, primarily to avoid passing the disease from one individual to another. Two other turtles were almost the victims of poachers but were freed and put back in the water thanks to the quick thinking of witnesses. Please note: the accidental capture in nets set for conch is the primary cause of mortality for sea turtles in Guadeloupe and in Martinique. Repository of an incredible quantity of debris all sizes and all kinds brought by hurricane Irma, the site of Galion has been undergoing regular cleanup operations since the month of October and is returning to its natural colors. In October, the Réserve dedicated several days to the clean up of the Galion beach and surrounding area. The staff, with the addition of 50 volunteers from the group Clean St-Martin, did a remarkable job in collecting and piling the trash collected on the beach along the side of the road, from where it was transported to the eco-site. The staff of the Réserve would like to thank all those from Verde SXM who took care of all this trash for free, Jardinia who provided a dumpster for the cleanup of Galion then took care of transporting it to the eco-site, and the RSMA of Guadeloupe, who cleaned the sides of the road between the Salines d’Orient and the Etang aux Poissons before leaving the island. In November and December, with the help of the association What De 9 and a public works company from French Quarter, the staff of the Réserve cleaned additional areas around the beach. At the same time, also at Galion, four agents of the Réserve collected close to 20 tons of debris by working full-steam for 19 days. The Réserve hopes to make this public beach accessible to the population as quickly as possible. But people will have to be careful where they put their feet, as there is still a lot of debris under the water. Safety Remains Of Primary Importance In addition to the environmental concerns, safety is an essential aspect of the collection and evacuation of all debris. Abandoned metal roofing can transform into a flying projectile during the next hurricane. And the number of containers that landed in the most improbable places should be cut into small pieces to be evacuated. Hard work, but necessary! What De 9, a local association in Saint Martin, in partnership with Contour Global, recently contacted the Réserve and offered to help with cleanup operations at natural sites, and also to make a donation of cleaning materials that they can provide: rakes, shovels, tools, gloves… Thanks! At the same time, the association Clean St-Martin showed their strength by undertaking the cleanup of mangrove located behind the former shelters at Orient Bay. This action complements those activities led by the Réserve, as the site in question is located outside of the Reserve’s territory and is covered with debris of all sorts. 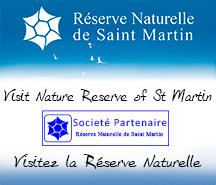 Clean St-Martin is happy to welcome all volunteers: More details available on the association’s Facebook page. 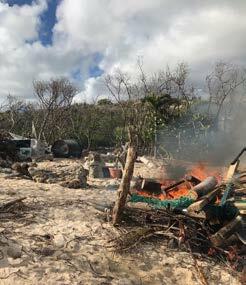 In mid-December, the Réserve attacked the cleanup of the small island of Pinel, focusing on an area behind the beach to the south where someone had been squatting for more than 20 years with no right to do so. Thus individual was informed that he could gather his personal affairs within two weeks, as the rest of his installation would be burned down. Irma did not spare Pinel: the pontoon and the shelter for the underwater pathway disappeared, as did one of the shelters on the discovery path, the other was essentially destroyed. The first task is to make the site secure by removing the debris that present a danger to the public. In late December, the Réserve went over to Tintamare, where Irma had blown six wooden tables attached to blocks of concrete to behind the beach, causing them to be damaged. The current thinking is to reconstitute four tables using elements that remain from the six original ones. The day after Irma hit, the Réserve was already worrying about its financial capacity to repair the damage. More than half of the Réserve’s budget is based on its ability for self-financing, to the point of 470,000 euros per year, thanks to economic and eco-touristic activities authorized to operate on its most beautiful sites, but most of which will not be in operation in 2018. Knowing that the damage caused by Irma to these protected sites was estimated at close to 850,000 euros, the Réserve decided to launch a “Go- FundMe” campaign to raise money. The ideas was to invite friends of the environment to support the financing of the Réserve in its new mission, that of saving the biodiversity of these exceptional sites and make sure they are restored to their original beauty. Result: 90 donors gave 7,600 euros. A sum that doesn’t come close to the needs of the Réserve, but every euro helps, and this money has been used to finance the first cleanup operations. Thanks to all participants! In Saint Martin in mid-December 2017, journalist Alexie Valois and photographer Alexis Rosenfeld came to make a report on the state of the island almost four months after hurricane Irma hit. But their meeting with the staff of the Réserve Naturelle encouraged them to take a special interest in the island’s protected natural sites and especially the underwater milieu. 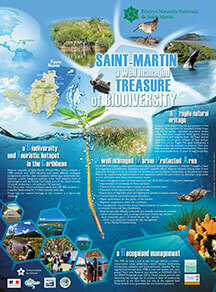 This article and its exceptional photos appeared in the January 4, 2018 edition of VSD, and accents the work done over the past 20 years by the Réserve Naturelle in Saint-Martin, while indicating the huge task ahead of us before these natural areas are brought back to the good health and beauty they had before this catastrophe. If the reconstruction of Saint Martin is advancing with baby steps, the vegetation is rapidly taking over and it is now urgent to cleanup our natural sites before the debris is completely recovered by vines and new growth. To this end, the Conservatoire du Littoral has recently called for proposal for the cleanup work on all such sites in Saint Martin, which will be done under the surveillance of the Réserve Naturelle. This operation will particularly focus on sites along the Route du Galion, the Etang de la Barrière, The Etang de Chevrise, Lucas Bay, the Salines d’Orient, The Etang aux Poissons, and the Etang de l’Anse Marcel. For example, there is a car that must be removed from the Etang de la Barrière and a fishing boat from Lucas pond. Once these efforts are accomplished, it remains to restore the bird observatories destroyed by the hurricane, including the observatory at the Etang du Cimetière de Grand-Case, which was partly destroyed during the stocking of hurricane debris put there by the Collectivity. Nature Regains Its Rights! In mid-December, the Conservatoire du Littoral hired a Saint Martin company to destroy the refuge for dogs that had been illegally built at Galion and condemned by the court to be demolished. The same company also removed the rubble and remains of the building house sheltering the generator of a restaurant that had been on the site illegally for years and summoned to leave by the Conservatoire. Since hurricane Irma, life at the Réserve returned a little more to normal on November 22 with the participation of Nicolas Maslach and Franck Roncuzzi at the “Copolen,” the steering committee for the environmental police, in Guadeloupe. Organized at the request of the prosecutor’s office in Basse-Terre, the goal of this meeting was to put an operational strategy in place to control the zones protected by the environmental code. The four themes discussed by the committee were wastewater systems, urbanism, protected zones, and pollution. Director of the Réserve de Saint-Martin, Nicolas Maslach, and Franck Roncuzzi director of the office for development, surveillance, and the environmental police, worked with the public prosecutors in Basse-Terre, a jurist, and the director of Environmental Affairs (DEAL), as well as representatives of the gendarmerie, the Conservatoire du Littoral, the National Office for Hunting and Wildlife, the National Forestry Office, the French Biodiversity Agency, and the Réserve of Saint Barthélemy. 1st Copolen of Saint Martin The first meeting by the steering committee for the environmental police (Copolen) of Saint Martin was held in mid-December, with the goal of putting in place a management strategy for the environmental police. This strategy was examined in relationship with urbanism and the plan for the prevention of risks, in the presence of the Réserve, vice prosecutor Yves Paillard, president Daniel Gibbs, prefect Anne Laubies, director of the service of urbanism, and representatives of DEAL, the gendarmerie, and the Collectivity. Overseas Minister Annick Girardin inaugurated the exhibit, Overseas Locales (Escales Outre- Mer), on November 30 at the Ministry in Paris, accompanied by the media, school groups, and the Réserve Naturelle de Saint-Martin, represented by director Nicolas Maslach. He was able to speak with the minister for several minutes about the impact of Irma on the Réserve Naturelle and the recovery activities put in place in the months after the hurricane and those to follow. The exhibit, fruit of a collective effort throughout the overseas areas, is intended to move around France and Overseas territories for several years. There are 50 photographs that illustrate for the first time the biodiversity of the 13 overseas territories –including Saint Martin– that comprises 80% of French biodiversity. In addition to the discovery of this extraordinary natural heritage –fauna, flora, endemic and endangered species– the exhibit puts an accent on protected zones, where the primary issue is how to maintain the biodiversity. The goal of the photographers and the sponsors: to build wider awareness for the general public, including school children, and share the importance of preserving our natural overseas richness, and on a larger scale, the eco-systems of our entire planet. The underwater study for the Réserve Marine de Saint-Barth, which was scheduled for December 7-9, was cancelled due to bad weather conditions. The Réserve de Saint-Martin, representatives of the Réserve de Petite-Terre and of CREOCEAN had come to lend a hand to the Territorial Environmental Agency of Saint Barth, as part of their annual cooperation linked to the underwater study of marine parks. The divers tried, but without success, to unroll 150 meters of graduated ribbon along the transect. Explication: the strong swells present around the Northern Islands at the end of the year contributed to the movement of a large quantity of sediment displaced by Irma. Suspended in the water again, it caused a lot of turbidity, but also marks a progressive restructuration of the underwater milieu, under the effect of the swells and currents, towards a return to normal. The study has been postponed until February 2018.